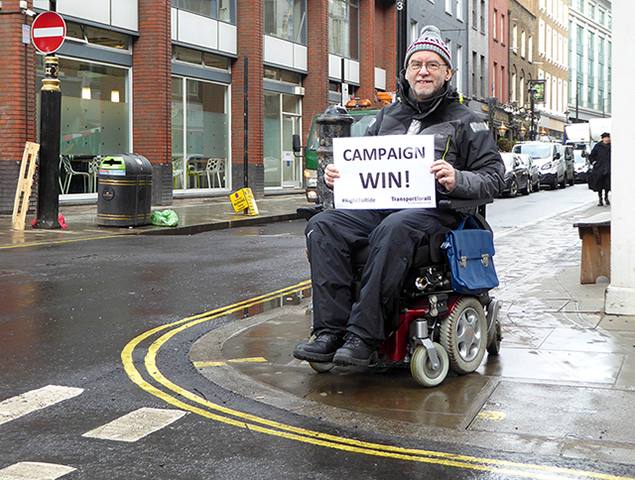 TfA member Chris Stapleton has achieved a major victory after a four-year-long campaign trying to persuade Westminster to introduce kerb drops in over twenty-five locations where they are missing. Thanks to Chris’s campaign, Westminster Council has recently agreed to implement twenty kerb drops in the next four months from the list of places he identified and to implement a further six in the financial year 2018/19. Kerb drops are a vital part of accessibility for wheelchair users and anyone else who has difficulty with steps. In all other London boroughs, kerb drops are plentiful and it’s almost always possible for a wheelchair user to cross the road with ease. But for some reason in the City of Westminster, which includes the busy areas of Soho and the West End, there are still very many places where kerb drops are missing. The pavements in Westminster are a terrible obstacle course, which sends people on needless, exhausting, time-consuming detours just to get along important, busy streets which for walking pedestrians are completely free and open and easy to use. Chris had campaigned for four years to get Westminster to take this issue seriously. He sent requests to Westminster’s Transport and Streets department; he tried to talk to Councillors who showed no interest at all. “The fact that pavements in Westminster – one of the most touristic areas in London – have been missing kerb drops for so long is a scandal. 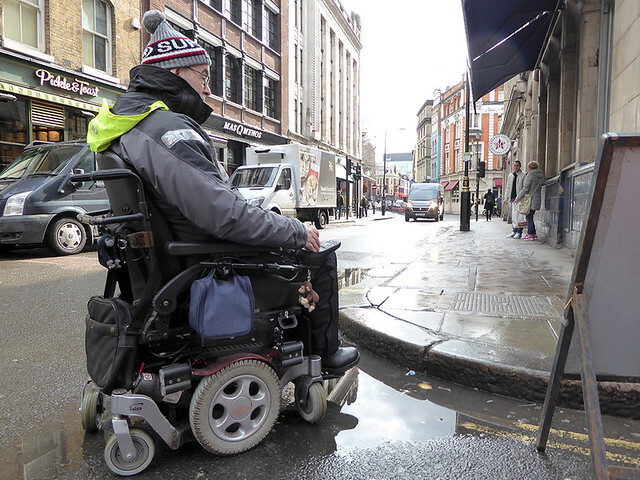 Our member Chris Stapleton, who is a wheelchair user, has spent years contacting the council on this crucial issue but was always knocked back.“Transport for All therefore really welcomes the great news that after much campaigning Westminster Council has finally agreed to install some drop kerbs around Soho”. Strangely, Westminster Council have been claiming that they were planning to introduce these kerb drops all along. Even stranger then, that the list of promised kerb drops happens to correspond exactly to Chris’s own list of locations for which he has been requesting them for some years – and that Westminster agreed to implement them just a few weeks after Chris was told in a face-to-face meeting with a council official that it was extremely unlikely that the kerb drops he was requesting would be implemented! This week Chris has been celebrating, after finding that the requested kerb drops at the junction of Noel St and Berwick St have already been introduced, and are of excellent quality. The impact of good, easy-to-use kerb drops cannot be overstated. They enabled wheelchair users to move around the city with just as much freedom as walking pedestrians: to go to work, socialise, have fun, visit loved ones, go shopping, and carry out all life’s other tasks and activities, without continually coming up against insurmountable barriers at street corners. If everyone who reads our articles/blogs, who likes it, helps to support it, our future would be much more secure.